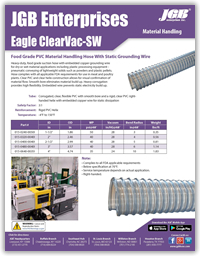 Eagle ClearVac-SW Hose - JGB Private Brand - Hose by Vendor - JGB Enterprises, Inc. Heavy-duty, food grade suction hose with embedded copper grounding wire for dry or wet material applications including plastic processing equipment - pneumatic conveying of lightweight solids such as powders and plastic pellets. Hose complies with all applicable FDA requirements for use in meat and poultry plants. Clear PVC and clear helix construction allows for visual confirmation of material flow. Smooth bore eliminates material build up. Heavy corrugation provides high flexibility. Embedded wire prevents static electricity build up. Service temperature depends on actual application.